Chemistry is a difficult subject to learn, in part because explanations for chemical phenomena are abstract, involving the interactions of invisible particles. Thus, students may construct ideas and explanations of chemical phenomena that are inconsistent with those accepted by the scientific community; these ideas may be resistant to change as they are based on the ways students perceive how and why things behave. It is important to identify students’ alternative conceptions so that measures can be taken to help students construct more scientifically acceptable concepts. 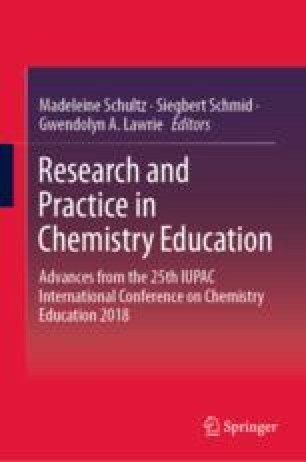 Studies have been conducted to determine students’ alternative conceptions over a wide range of topics in chemistry, including ionisation energy. In a previous study, a pen-and-paper two-tier multiple choice diagnostic instrument on ionisation energy was developed for use in the classroom. This chapter describes the further development and use of a web-based version of the instrument to determine students’ thinking in the topic. Such web-based instruments are easily made available on the internet, readily administered to students and the results can be automatically collated, saving the time and effort of researchers as well as teachers. This is one way in which the use of educational research by teachers can be facilitated, impacting practice in the classroom. The authors would like to acknowledge the contribution of the teachers, students and school leaders involved in facilitating this study, enabling the research to be successfully completed.